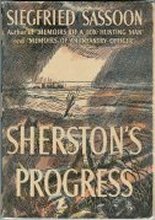 First published in 1936, this is the final book in the “Sherston Trilogy.” The book continues Sherston’s story in the ‘Slateford’ shell-shock hospital. He tells of the people he meets, the friends he makes and his struggle with the thought of his troops fighting it out against the Germans in France on the one hand, and his somewhat pampered existence in the safety of the hospital on the other. Badly wounded, but not killed, Sherston is sent back to convalesce in England. The war ends while he is still in hospital, a survivor in a changed world. This is where Sassoon and Sherston leave us. Sassoon however returns later in his trilogy of real autobiography. Read a review of this book published in The Saturday Review, 10th October, 1936.